I had the opportunity to attend the ribbon cutting for The Shops of Perry Crossing in November 2015. Formerly the Metropolis Lifestyle Center, The Shops at Perry Crossing celebrated a $11.1 million renovation to the Plainfield shopping center that gave the mall a whole new look and included a pop-jet fountain, gazebo and koi pond. Since those renovations, The Shops at Perry Crossing attracted a number of new retailers, and many just opened at the mall in the past year. This weekend, I took advantage of the "warm" 40-degree weather, and took a stroll around the mall to check out some of the new stores. 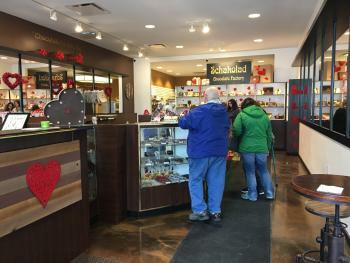 Owned by Avon-local Allison Lukovich-Dixon, The Schakolad Chocolate Factory - Westside Indy franchise is of course a welcome addition to the mall in my book. Like most people, I love chocolate, and I was more than happy to check out this new store. I had an opportunity to talk with Dixon while I was at the store. Dixon has been making chocolate for many years and finally decided to take the plunge and open her own chocolate shop. She said she chose the Schakolad Chocolate Factory franchise because of the company&apos;s flexibility. She sells Schakolad&apos;s signature items, but also has the ability to make some of her own favorites. I tried the mint chocolate truffle, and it was delicious. The store has only been open since December, but has already had tremendous success with the Christmas season and is preparing for the Valentine&apos;s Day rush. In addition to chocolates, the store also offers hot chocolate, gelato and much more. Owned by former Indianapolis Colts linebacker Gary Brackett, The Stacked Pickle opened at The Shops at Perry Crossing in November. The Plainfield location is one of 10 locations in the Indianapolis area. I had already visited the Carmel and IUPUI locations in the past, but my family and I decided to try the Plainfield location on a recent Saturday night. Knowing the restaurant might be busy at dinner time, we chose to go around 4:30 p.m. and were able to get a table right away though the restaurant was still busy. We, of course, ordered the fried pickles as an appetizer, and they were great as always. I ordered the fish and chips for my dinner, my husband got the Beam Burger, and my daughter had chicken fingers and mandarin oranges. The menu also included several other appetizers, burgers, sandwiches, flatbreads, salads, wings and even rice bowls. The menu also included a selection of four desserts, and the restaurant also boasts an extensive drink menu. I found the Stacked Pickle to be very clean with numerous TVs for watching sports. Great for families, this location would provide a great place to watch a big sporting event. Next time you&apos;re at The Shops at Perry Crossing, be sure to check it out. 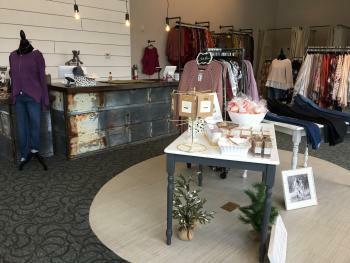 This women&apos;s boutique is one of four locations in the Indianapolis area and just opened in the last few months. I was greeted by two friendly employees and enjoyed browsing the trendy clothes that seemed to average in price at around $30-$50. Many of the items included on-trend floral prints, but there were also many striped and solid tops, as well. I&apos;m excited there is another source of trendy, figure flattering, and reasonably priced clothing here in Hendricks County. Sweet Olive & Co also stocks items online. The new CRG Event Center, owned by the Cunningham Restaurant Group, opened in November. The event center is available for weddings, corporate events and other outings. The new event space is located in the former Serendipity space on the second floor of the mall above the Stacked Pickle and uses catering menus that feature food from Cunningham restaurants, including The Shops at Perry Crossing&apos;s own Stone Creek Dining Company and Bru Burger. 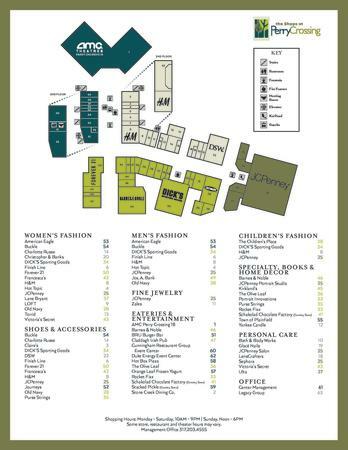 In addition to locally owned stores, The Shops at Perry Crossing also recently added an H&M and Forever 21 Red while the Bath & Body Works and Victoria&apos;s Secret stores have been updated. The Shops at Perry Crossing will also host some fun events at the mall in the coming months. Upcoming events include the No Luck Run on March 18 and Movies in Town Square on May 31 and June 7, 14, 21, and 28. No announcements have been made about any upcoming additions to The Shops at Perry Crossing, but I&apos;m looking forward to seeing what comes to the shopping center next, and you can keep up with the latest by clicking here.